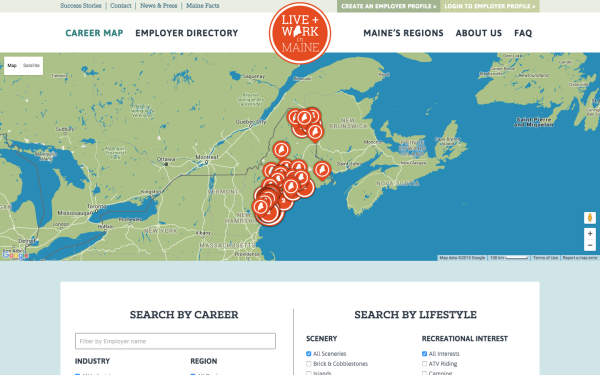 Screenshot of the website for "Live + Work in Maine." PORTLAND, Maine — The 11,000-employee Eastern Maine Healthcare System has a lot of recruiting needs, and that’s likely to continue. MacLaren said managers throughout the system look to surrounding communities before casting a wider net for job openings. Casting that wider net is part of its strategy, and EMHS and many other large employers in Maine have signed onto an effort they hope will make out-of-state recruiting easier. Ed McKersie, founder of recruiting firm ProSearch and of job listing website Jobs in ME, has launched a new website called “Live + Work in Maine.” The site takes a new approach to advertising to job seekers, not by focusing on jobs themselves but on company and regional profiles. McKersie said the site is aimed mostly at large employers with challenges attracting enough employees with the right skills. He said Maine has competitive advantages for recruiting from out of state, which he intends for the new website to show. The recruiting challenge goes beyond health care. The bulk of Maine’s working-age population is nearing retirement, with a smaller number of younger workers trailing behind. About 115 companies have listings on the site, for which the initial postings were free. McKersie put up the money for the site through ProSearch, he said, and may eventually charge an annual fee for listings. Employers on the site span the state, from S.W. Collins Co. in Caribou to Hussey Seating in North Berwick, with each employer tied to a range of different search dimensions. Those dimensions include regional and local amenities or allow a person to search for employers that are near “pastures and farms,” “sandy beaches,” have access to nearby fishing and hiking or other attributes. The focus is helping employers introduce prospective employees to the area and its amenities, which can pose a recruiting challenge. Even within the state, MacLaren said she sees the site serving to introduce someone from southern Maine to the western mountains or northern regions, which she sees as helpful to EMHS’ in-state and out-of-state hiring. “Our talent acquisition teams view the website as a real resource for us when we are talking to people in the state and across the country about what it’s like to live and work in Maine,” she said. She hopes it will help make sure an employee is the right fit for a job before taking it by providing more information on what it’s like to live in a specific part of the state. McKersie, who founded and later sold JobsinME.com, said he hopes the site can help address those and other related recruiting needs, such as giving a sense of how “thick” the job market is before prospective employees make a big move. “For the person that gets an offer from Idexx or EMHS, they say, ‘this is fantastic, but what if it doesn’t work out? '” McKersie said. The site, he hopes, can help answer that question by showing major companies in related fields that are in the area. That, he said, could be useful to someone later in a career who’s making a major life change to move to Maine or for people starting out who’s interested in what they might do after a 2 to 3 year stint. “What I’m trying to do is kind of grease the skids and create a more transparent job marketplace for people who are currently here and then try to market that out to people who aren’t here yet,” McKersie said.